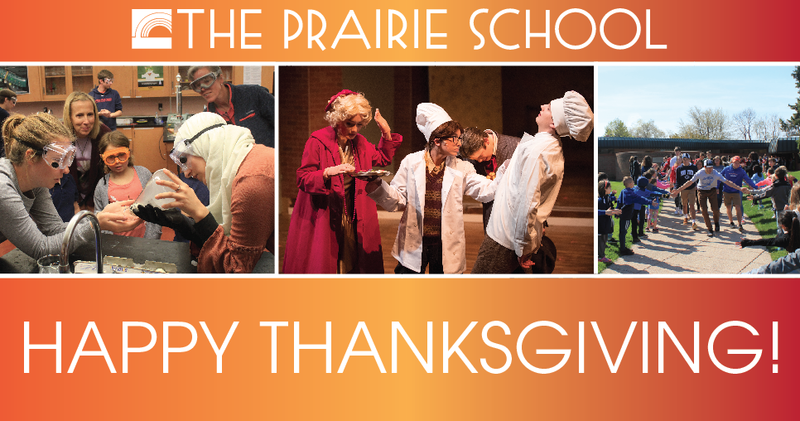 We have much to be thankful for this fall and I continue to feel personally grateful to be a part of this unique Prairie community. We are all fortunate to be part of an institution where people from every imaginable point of view and from all over the world come together with the shared purpose of creating the next generation of leaders. Our Prairie families, faculty, and alumni hail from and live on every continent and they succeed in careers that reflect the diversity and complexity of the modern world. Yet, we share a belief that with hard work and a broad renaissance education that emphasizes creativity, communication, and shared problem-solving, our students will be prepared to succeed and be positive difference-makers for their families, workplaces, and neighborhoods. Our alumni thrive as creators, not consumers. They are leaders in their professions: doctors, judges, and architects; public servant-leaders — teachers, first responders, and active duty military; business leaders — entrepreneurs, brand managers, and CIOs; along with every imaginable type of artist and scientist. At least once a week, an alumnus stops by school to visit and share their story. These stories often involve overcoming adversity; as these former students describe their struggles, they share that the perseverance and character they developed in our classrooms, arts spaces, and athletic facilities gave them the strength to overcome and thrive. Within each story, there is usually a specific teacher or group of teachers who believed in them, who inspired, supported, challenged, and respected them — whom they want to thank for being an important part of their lives. These relationships that develop between students and faculty and among the students are the “special sauce” that makes Prairie, Prairie. These mentoring partnerships develop both inside and outside of the classroom. Our master teachers understand that every person is unique and that finding the right research-based pedagogy to intellectually challenge each student is an art. They also understand that getting to know each student and helping each one see their self-worth takes time and effort in the dining room, playground, commons, advisory seminars, arts studios, athletic practices, and club meetings. Watching these relationships develop, and our students growing as a result, is what I am most thankful for this holiday season. In addition to building community one relationship at a time, we also strengthen our school by coming together to help those less fortunate. I hope you will join our annual Holiday Party for adults in the Racine community with cognitive disabilities on Sunday, December 9th from 1:00-3:30PM. As a volunteer, you can make crafts, decorate cookies, shoot basketballs, play Ping-Pong or BINGO, share a talent, or sing holiday carols. We also need help with snacks, beverages, prizes, and gift bag items. To participate or bring items, please email Shannon Schafer. I would also like to invite you to join us on Friday, December 21st at 11:00AM in the JAC for our annual holiday celebration. This year, based on Daniel Pink’s recent book, When: The Scientific Secrets of Perfect Timing, that cites research showing that if exercise wins the gold medal for mental and physical health, synchronized choral singing wins the silver, we will all be joining together to sing two songs as a part of the program. It should be fun and will be a great time to catch up with friends and thank the teachers who create the Prairie experience. I hope you will join us.